David Adjaye Associates, Mass Extinction Monitoring Observatory, Isle of Portland. Some absurd comments on the absurd contemporary architectural language justifying David Adjaye's MEMO project. Posted in babel and tagged with what the huh, extinction, architecture, construction, irony, sarcasm, design commentary. February 12, 2015 by j ;. series || 11 weeks || Foucault, 1982. Foucault concisely explains the history of space, architecture, and power, and brilliantly deals with architecture's misguided anxieties about society and the power of architects. Posted in babel and tagged with architecture theory, Foucault, foucault in architecture theory, space, power, capitalism, architecture, history, modernism, jurgen habermas architecture. February 11, 2015 by j ;. Jürgen Habermas breaks down the problems of Modernism's preshistory in an evaluation of Post-Modernism's dubious break, ultimately working toward a typology of postmodern movements based on their political agendas. Posted in babel and tagged with architecture theory, modernism, Post-Modernism, modernity, politics in architecture, jurgen habermas architecture, frankfurt school, capitalism, city, functionalism. February 9, 2015 by j ;. 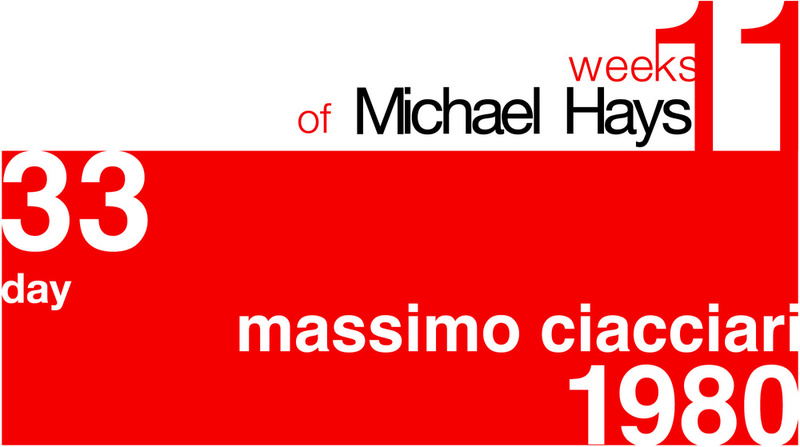 Some quotes from the Manhattan Transcripts mark the 34th day of the endless Michael Hays anthology project. Check out these blurbs and images. Posted in babel and tagged with 11 Weeks of Michael Hays, bernard tschumi, Manhattan Transcripts, architecture theory. February 5, 2015 by j ;. Massimo Cacciari presents: The irreconcilable struggle between Heidegger's "Dwelling" and the modern era, and tells us (kinda) why it's such a problem for contemporary architecture. José Quetglas provides a fascinating and hilarious reading of Mies's iconic Barcelona Pavilion as an irrevocably isolated architectural object, and tells more about Post-Structuralist context than a casual reading my suspect. Posted in babel and tagged with architecture theory, Mies van der Rohe, Barcelona Pavilion, Jose Quetglas, populism, new criticism, barcelona. November 26, 2014 by j ;. series || 11 weeks || Gehry, 1979. An excerpt from Frank Gehry about his house, his interest in fragmentation and materials, and a few notes on the implications for architectural making from this blurb. Posted in babel and tagged with Frank Gehry, Deconstructivism, Gehry House, architecture theory. November 12, 2014 by j ;. Leon Krier laments the rejection of his neo-traditionalist project for the School at St Quentin-en-Yvelines and the shabby state of architectural production. Posted in babel and tagged with 11 Weeks of Michael Hays, Leon Krier, neo-traditionalism, new urbanism, architecture theory. October 3, 2014 by j ;. Culot and Krier present this vision of the postmodern city saved from the ravages of modern industrial capitalism and the cynical architectural exploitation of the Post-Modernists by a return to traditional culture and traditional architectural production. Posted in babel and tagged with 11 Weeks of Michael Hays, culot & krier, populism, sign, architecture theory, capitalism, Tradition, craft, urban, city, Post-Modernism, irony, new urbanism. September 29, 2014 by j ;. series || 11 weeks || Colquhoun, 1978. Alan Colquhoun deploys semiotics and historical mythification to craft an exegesis of Michael Graves's work as both profoundly modern and seriously postmodern. Posted in babel and tagged with Alan Colquhoun, Michael Graves, semiotics, semantics, linguistics, architectural signs, Post-Modernism. September 24, 2014 by j ;.